Building Construction 2 Edition The science of building construction and design is evolving more quickly than ever before. The second edition of this outstanding text builds on the previous version. It incorporates the latest updates available, features hundreds of new pieces of artwork, and is now in FULL COLOR! Written by an author team with decades of experience in architecture, building construction, engineering, and teaching, Building Construction: Principles, Materials & Systems 2nd Edition is a comprehensive and fully illustrated introduction to construction methods and materials. 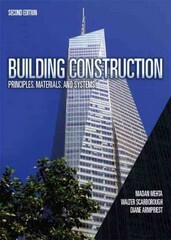 Continuing on with the books unique organization, Principles of Construction are covered in Part One and Materials and Systems of Construction are covered in Part Two. Emphasizing a visual approach to learning, it includes more than 1,400 original illustrations and an extra large trim size (9” x 12”) that provides an open and inviting layout that readers are sure to appreciate. Plus! A completely revamped and expanded companion website, "MyConstructionKit", is also available!